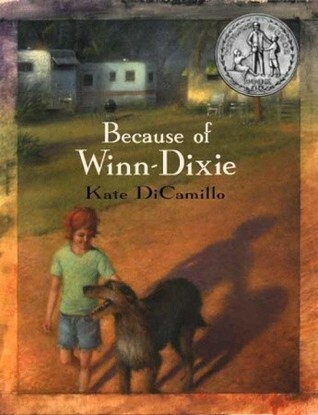 From Goodreads: Kate DiCamillo’s first published novel, like Winn-Dixie himself, immediately proved to be a keeper — a New York Times bestseller, a Newbery Honor winner, the inspiration for a popular film, and most especially, a cherished classic that touches the hearts of readers of all ages… The summer Opal and her father, the preacher, move to Naomi, Florida, Opal goes into the Winn-Dixie supermarket–and comes out with a dog. A big, ugly, suffering dog with a sterling sense of humor. A dog she dubs Winn-Dixie. Because of Winn-Dixie, the preacher tells Opal ten things about her absent mother, one for each year Opal has been alive. Winn-Dixie is better at making friends than anyone Opal has ever known, and together they meet the local librarian, Miss Franny Block, who once fought off a bear with a copy of WAR AND PEACE. They meet Gloria Dump, who is nearly blind but sees with her heart, and Otis, an ex-con who sets the animals in his pet shop loose after hours, then lulls them with his guitar. Opal spends all that sweet summer collecting stories about her new friends and thinking about her mother. But because of Winn-Dixie or perhaps because she has grown, Opal learns to let go, just a little, and that friendship–and forgiveness–can sneak up on you like a sudden summer storm. I recently finished reading Because of Winn-Dixie aloud to my five-year-old (on the recommendation of my CP, Temre Beltz — thanks, Tem!) and I’m not sure who loved the story more: my girlie or me. Protagonist Opal is just darling. She’s sweet and straightforward and open-minded. She’s curious and precocious, but she’s also desperately lonely. She has an intense desire to fit in, to make friends and find her place in the world. I loved Opal for her bravery and her inquisitiveness and her determination. Loyal Winn-Dixie crashes (literally) into Opal’s life within the first few pages of the novel. Her world brightens immediately. Winn-Dixie brings change just by being his shaggy self. He’s the catalyst through which Opal’s horizons begin to expand. His wagging tail and cheesy doggy smile help Opal meet people and make connections and even address some of the issues she has concerning her estranged mother and her well-meaning preacher father. Pretty much everything Winn-Dixie did made me smile, mostly because he brought so much joy to Opal. The new friends who enter Opal’s life throughout the course of this story are as colorful and special as Opal herself. They’re old and young, simple and educated, happy and sad (Otis is my favorite!). They’re a diverse bunch, yet through Opal and Winn-Dixie, they find common ground. The relationships Opal forms with her new friends are unique and beautiful. Each character is wonderfully flawed, allowing Opal to see that people shouldn’t be defined by their mistakes. They let Opal know them for who they truly are, and they teach her about herself in the process. Opal’s journey to self-acceptance and self-reliance makes for a captivating and uplifting story. Tell me: Do you have a favorite middle grade novel? I can’t believe I haven’t read this one yet! It sounds fabulous. Thanks for the rec, Katy! I bet you’ll love WINN-DIXIE, Rebecca, especially since you’re such a MG fan. It’s a charming story, and a quick read, too. Did you know I’ve NEVER read this one? I hadn’t heard of it until the movie and by then I was much older than the appropriate age (and I have trouble getting into middle grade books for some reason). I really ought to pick it up at the library. It sounds great. I adored CHARLOTTE’S WEB growing up and LEMONY SNICKET (who, btw, I get to hear speak on Oct 27th since I’m helping out @Boston Book Fest, whee! ), as well as many other classic MGs….but never WD! Guess i have to change that, huh? Thanks so much for the review, Katy! My pleasure, Rachel. WINN-DIXIE has that same innocent charm that CHARLOTTE’S WEB has, but without the talking animals. 🙂 It’s a very sweet story. I read this a couple years ago and loved it. The Litmus Lozenges are still one of my favorite things ever fictionally invented… that whole thread really stuck in my brain. I haven’t read this one yet, but I have seen the movie and really enjoyed it. I love seemingly simple stories with much deeper truths tucked inside. THE TALE OF DESPEREAUX by Kate DiCamillo is like that too. 🙂 Thanks for sharing your thoughts on this! Now that I’ve read WINN-DIXIE, I totally want to read DESPEREAUX. Kate DiCamillo has sold me on her wonderful characterizations and lovely writing. Definitely read WINN-DIXIE if you get the chance, Jaime. The movie is very true to the book, so if you like one, you’ll most likely enjoy the other. Such a wonderful and thoughtful review, Katy! Thank you so much for this. I completely agree that it is a seemingly simple story that rings of so much truth and beauty that I felt like I was a sponge just soaking up every encounter that Opal had. I couldn’t get enough 🙂 Otis is my favorite too! I think I need to see the movie just to see how he was portrayed – he was so incredibly vivid in my mind. I think one thing I really carried away from it is making sense of sorrow and finding the beauty in loss, mistakes, and even misunderstandings. I think this will be one of those books I reread every few years. I definitely need to read more of Kate DiCamillo’s books! My daughter loved this one. Great Bookinista pick! I usually don´t read a lot of MG but this sounds great! I need to check the French translation for my niece and nephew 😀 Thanks so much for sharing, Katy! I bet they’d love it, Elodie. Such a sweet story! Let me know if you find the translation.